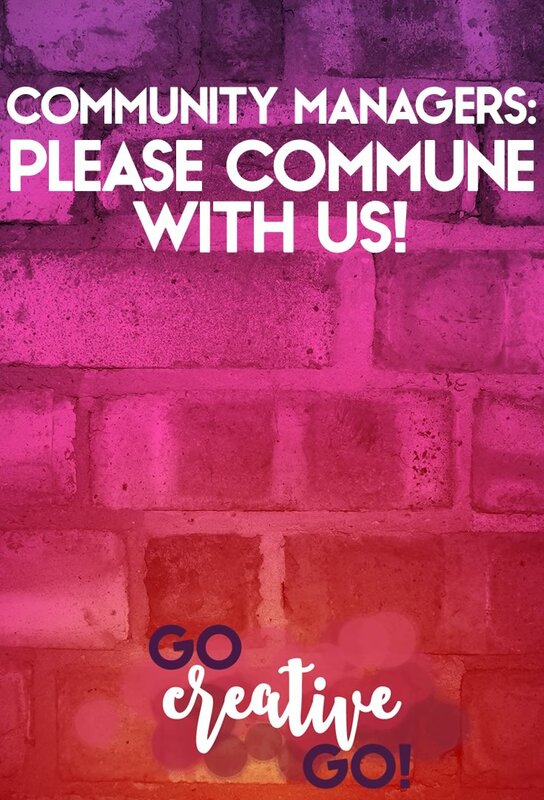 Dear Community Managers: Please Commune With Us! - Go Creative Go! Community managers come in many shapes and sizes. Some are quick and witty, enjoying the short, sweet and to the point reply. Others are more warm and fuzzy, ready to talk it out and engage in a slower, steadier conversation. But any community manager worth his/her salt knows that conversation is the key. A community intent on communicating and conversing is ever so much more beneficial than a community built around the owner’s need to promote only themselves and their products and services. Community Managers, Commune With Those In Your Community! verb (used without object), communed, communing. to converse or talk together, usually with profound intensity, intimacy, etc. ; interchange thoughts or feelings. You probably weren’t expecting me to paraphrase Beyonce (Destiny’s Child, actually), but I like to keep you on your toes. As the manager of my own growing community, I also like to show I care by seeking out and using a name in my replies. It takes only seconds to check a bio for a name. Mere minutes to click through and find an about page that might share a name. But it’s so much more personal, more meaningful, when I thank Jade or Desmond. Building a rapport is part of communing with those who make up your community. You build a rapport with a person, not a company. You might be impressed by and loyal to a big brand like Nike, but any rapport built is with an individual, a sales rep or customer service expert. I can’t tell you how many times I receive ridiculous automated Twitter DMs addressed to Go. That’s NOT my name. It’s one tiny bit of my business name, of my Twitter handle. It shows a marked laziness, because my name is front and center, readily available for a quick copy paste if it’s too much to remember the six letters in the span of seconds it would take you to send a personalized reply. A friend and colleague recently hired a new community manager. And while she’s responsible and responds to shares in a timely fashion, she doesn’t add a name to her replies. The #CMGR she replaced did. It’s a loss. I don’t feel as engaged, even though my colleague’s company still does great work. But the personalized tough, even when so seemingly small, really makes an impact. The Best Community Managers Excel At What Can’t Be Scheduled! Scheduling posts isn’t rocket science. Anyone can set up a queue and schedule a variety of posts, especially if you’re only intent on sharing content you’ve created. Sure, there’s certainly some research and science involved in selecting the best times of day, days of the week, etc., for those scheduled shares. Don’t get me wrong. I do this for a living. I track the numbers and note the nuances. But the share is such a small part of the community experience. Sure, good shares can lead to reciprocal sharing, retweets, even comments. But it’s the responses to those comments and those shares that allows you to take the next step. It’s the follow-up question that you can’t schedule, that you must selectively send, that creates a real connection. When you take the time to ask me how many cups of coffee I’ve had that morning, it shows me you took the time to read my bio and that you’re choosing to interact with me in an attempt to get to know me as a person. You (Or Your Boss) Didn’t Write the Book (Or The Blog Post) On EVERYTHING! Self-promotion is absolutely part of social media marketing. We are in the business of running a business, after all. But, and it’s an all caps, bold BUT … there’s a crafty balance that goes into being a smarter, savvier, more social community manager. There’s a wealth of knowledge accessible and ready to be share across the Internet. Seek out the smarts of others, and selectively share them along with your own content. A community is made up of more than one voice, one viewpoint, one set of values. Cheap Design: Cheats You & Your Brand! Smart Solopreneurs: Take Care Of YOU First!